Herefordshire & Wye Valley Cider Route01432 268430workShopThroughout Herefordshire there is a strong tradition of farm cider making. Farmers produced cider to be drunk by the farm labour force during the following year, especially at the busy times of hay-making and harvest. Farmers used to sell cider to local pubs and cider merchants for re-sale in towns. Experience this heritage by following the unique Herefordshire & The Wye Valley Cider Route. For 350 years cider production in Herefordshire has been on a rollercoaster, periodically rising to become an industry of great reputation. Throughout this time Herefordshire has been the major player in cider making in Britain and Herefordshire people have led the way. There is no better place to find out about cider. 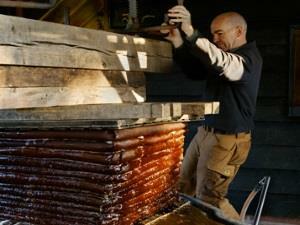 Cider making is an agricultural industry which has proved especially attractive at times of depression. Cider fruit keeps and its appearance and size are of no importance. Cider production is an activity for the slack months at the year end and orchards are useful for other farming, for instance grazing stock. Herefordshire bacon was reputed to taste especially fine! The Cider Route is a circular driving route around the county visiting cider producers and specialist retailers and the accompanying Herefordshire & The Wye Valley Cider Route website contains additional information. Herefordshire also boasts two Cider Cycling Routes. The Pembridge Cider Cycling Route is in the heart of Herefordshire’s black and white villages and the Ledbury Cider Cycling Route is in plain sight of the glorious Malvern Hills. Throughout Herefordshire there is a strong tradition of farm cider making. Farmers produced cider to be drunk by the farm labour force during the following year, especially at the busy times of hay-making and harvest. Farmers used to sell cider to local pubs and cider merchants for re-sale in towns. Experience this heritage by following the unique Herefordshire & The Wye Valley Cider Route.